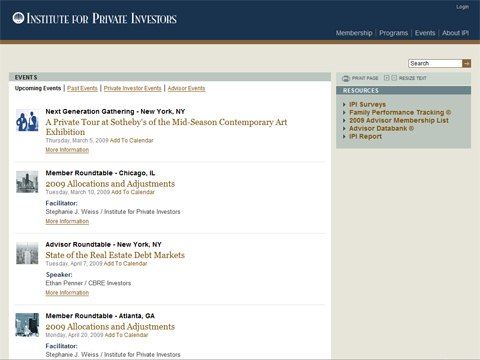 DPCI helps design and launch a new community-driven Private Investors site for the Institute for Private Investors. 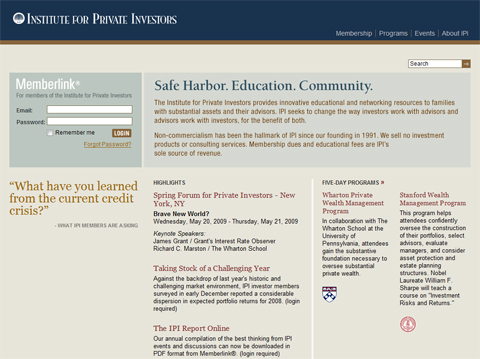 DPCI helps design and launch a new community-driven Web site for the Institute for Private Investors. The Institute for Private Investors (IPI) is a private community membership and networking organization for families with substantial assets and their trusted advisors. Since its founding in 1991, IPI has continually sought a non-commercial approach and therefore does not endorse any investment products or services. As an online-driven organization with offices in New York and San Francisco, IPI needs to maintain a secure online interface with multiple levels of access for its members to interact with advisors and with each other. Providing educational opportunities for its members is an important aspect of the IPI mission. As such, IPI partners with both the Wharton School at the University of Pennsylvania and Stanford University to provide Wealth Management programs for its members throughout the year. To extend its reach without compromising benefits to its current members, IPI sought to build a flexible, modular Web site to replace Memberlink®, its existing Web site, with a customized experience based on membership type and unique, member-driven interests. IPI's primary members are private investors, who would be the core users of the new Web site. That said, advisor members also need access to certain areas of the Web site and must have the ability to engage with private investors in a way that adds value while preserving IPI's safe harbor policy. Driven by its desire to move away from an email-based Listserv community and to provide better value and service for its members, IPI retained DPCI as the development partner to implement, test and deploy a new Web content management system. The goal was to provide an easy method for creating a community-driven Website for IPI's "Next Generation" members. The new Web content management system had to allow IPI's members to create, comment upon and search for content throughout secure areas of the site. IPI also wished to deliver educational programming across multiple media channels throughout the site. The development of the new Web site had to be undertaken in a way that respected the various needs of IPI's current private investor members. Failure to service this "core" and to preserve the 90 percent renewal rate would risk compromising IPI's mission and damaging its brand. DPCI implemented Drupal 6, an open-source Web content management system based on LAMP (Linux, Apache, MySQL, and PHP) architecture, for this new application. Although this version was a new release, the core was solid and the goal was for IPI to take advantage of the current and most up-to-date technology. With Memberlink 2.0®, DPCI customized Drupal to create a complex business application that includes tools and enhanced community features such as custom profiles and alert preferences, peer networking through the Request for Connection tool, private messaging, anonymous conversations, event registration and online access to resources such as event handouts and recordings. Complex user roles, access levels and personal preferences were created and tested meticulously to ensure that highly confidential investor information would only be visible to those who should have access. The Request for Connection (investor-to-investor) and Request for Information (investor-to-advisor) tools provide a truly social level to the Memberlink 2.0 experience, connecting individuals with common interests and mutual needs. For example, investor members choose the attributes they are looking for in a firm using the Request for Information tool and the system returns investment firms that match the appropriate criteria. From there, an investor can request additional information from the firm(s) selected. Likewise, using the Request for Connection tool, investors can connect to other investors with particular interests and areas of expertise. DPCI developed a custom alerts module to provide more than 25 different alerts using customizable templates. A member replies to a posting through email and can rest assured that their identity is preserved through the system's permissions control panel, keeping alert messages completely anonymous. DPCI made many improvements to the system's Forum module. With complex privacy preferences, members can use the AJAX-powered interface to share topics across multiple forums. Administrators have granular control over who can read their postings and where users can post topics. An added convenience with Memberlink 2.0® is that private investors can post questions and initiate conversations both on the site and through email. These conversations can be ‘investor only' (eliciting advice from peers) or can be flagged as "Ask an Advisor," anonymously alerting the 197 advisor firms to respond. Additionally, DPCI developed the site to be Blackberry-compatible, allowing members to access Memberlink 2.0® on the go. Now, IPI can deliver programming across multiple media channels. Members can take advantage of a clean and flexible Web site that offers peer networking, investor conversations, private messaging and content restrictions based on membership levels. The improved platform provides IPI staff with tools to easily and inexpensively customize elements of the site. Compared to the previous Listserv, the new Drupal Web content management system provides IPI with the tools to publish a wide range of information and offers significantly more functionality to allow members to communicate with their peers. This new community-driven site will strengthen the IPI brand, enhance the membership experience and give IPI a powerful platform to accommodate future business objectives. DPCI provided swift response, training, and consultation on our rapidly changing requirements, allowing us to better mobilize volunteers to meet the most pressing needs of the community.